Along with the Hawdon Street Private Cemetery, Warringal (Heidelberg) Cemetery was the second, and public cemetery, to be located in Heidelberg. Initial records of burials (Death Certificates) have it noted as the Heidelberg Cemetery and this does create some confusion as a number of burials at the Hawdon Street Cemetery also note the burial place as the Heidelberg Cemetery on death certificates. There is a need to check the cemetery records to identify which was the actual cemetery for the burial. Later death certificates do note burials at Warringal Cemetery, Heidelberg. In October 1853, land was set aside in the Heidelberg area for a cemetery and in 1854 the area was gazetted (23rd March, 1854). The first recorded burial in the cemetery was in April, 1858 but there are memorials in the cemetery that note there were burials in the cemetery before March 1856 when the cemetery was officially gazetted. In August 1882 the Austin Hospital for Incurables was founded only a quarter a mile away from the cemetery. The Cemetery Trustees imposed a five shilling fee on the usually free public burials and decided that quick lime was to be placed in coffins of anyone dying of fever or other contagious diseases. Pauper burials continued at the cemetery until the late 1920s. The cemetery nearly reached capacity by 1900 and the wide paths and land around the edges of the cemetery was then sold for additional graves as the Trustees searched for additional land to be used. In the following years the revenue for the cemetery was drastically reduced and the cemetery fell into disrepair until in 1981 the Heidelberg Council took over control of the cemetery as the only Trustee. The Heidelberg Council became part of the Banyule City Council and as well as the Warringal Cemetery the Council is now the Trustee for the Greensborough and Hawdon Street Cemeteries. In 1988 the Heidelberg Council commissioned a review and report on the cemetery and with the implementation of a number of recommendations from the report - rotunda, memorial wall, rose garden and the resale of unused sites and no longer considering the old denominational boundaries in the cemetery, the cemetery became viable again. It is still in use today. Banyule Council Members form the current Trustees for the cemetery. Currently the Cemetery Trust is considering putting the burial records for the cemetery as a searchable database on the web, but the date for this is still not known as there is further checking proceeding to ensure all records are complete and as accurate as possible. Hopefully the database might be available later this year (2005). 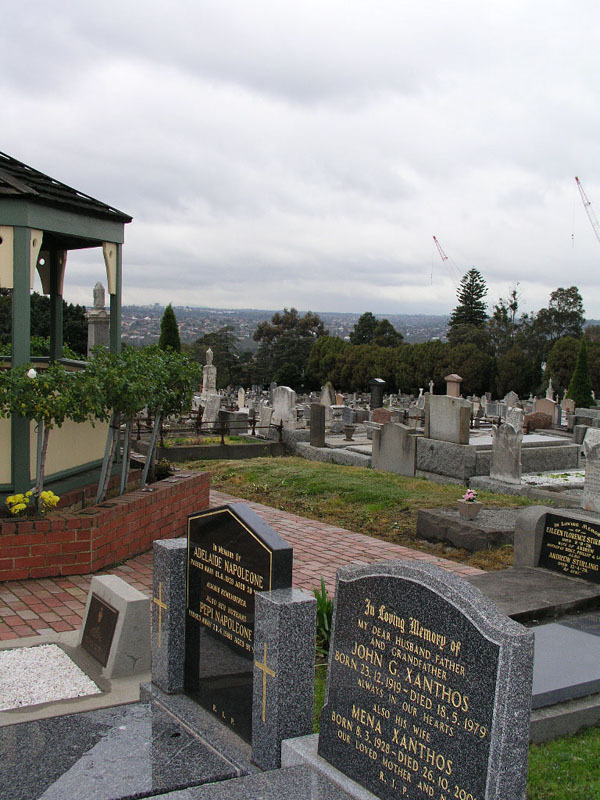 Consideration is also being given to add the Greensborough and Hawdon Street Cemeteries burials to this database. The Banyule Council holds the burial records for Warringal Cemetery and further records are held by the Heidelberg Historical Society and limited Memorial Inscriptions are held by the Genealogical Society of Victoria - GSV, and the Australian Institute of Genealogical Studies - AIGS (1853-1912 transcribed by G.P. Townsend in 1913). * Sacred to the memory of Michael PEGG who departed this life, June 1st, 1853 aged 12 years. * Sacred to the memory of James ROSS who died 16th October, 1863 also their oldest daughter, Jane who died in infancy. [NOTE: James ROSS was one of the earliest pioneers in the area]. * Sacred to the memory of Catherine BLOXHAM, native of South Ireland, the beloved wife of Joseph Bloxham, who departed this life February 14th, 1857, aged 53 years. * In loving memory of Francis OXLEY, died 11th November, 1866, aged 36 years, also of Annie Hayward, daughter of the above who died in infancy. Heidelberg is approximately 14 km north-east of Melbourne with land being sold by the Crown in 1838, making it one of the earliest rural areas. By 1840 there was a surveyed township named Warringal (Aboriginal for "eagle's nest") but the name was changed to Heidelberg shortly after. 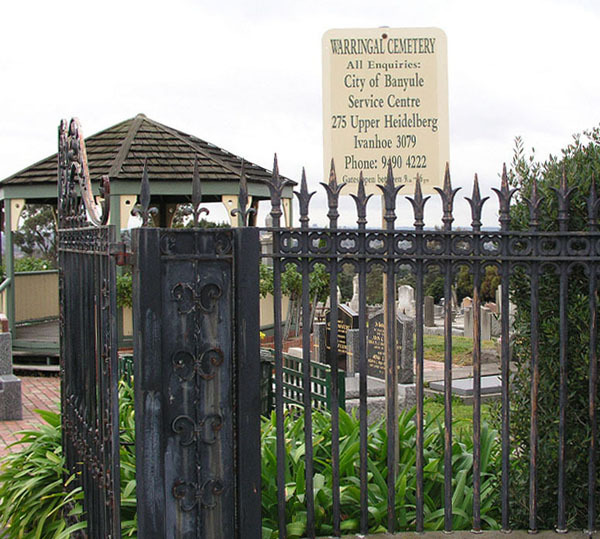 The cemetery kept the original name of the township - Warringal. The cemetery is located in Upper Heidelberg Road (main entrance) with a number of further entrances in surrounding streets. Unfortunately I do not have the burial records. My interest is mainly in the history of the cemetery. The burial records are only held by the cemetery trust. You will need to write to the following for burials and specific grave information.